Would you like to be lulled by the motion of the waves at sea while sunbathing? This is certainly a wonderful dream that could come true on holiday in San Remo. Sailboats stirred by a gentle breeze exert considerable charm, as does the discovery of the sea floor, diving mute with tanks or simply snorkeling with mask and fins. The vastness of the sea has always been fascinating, so why not take a closer look and discover it by immersing yourself in its waters or surfing its waves on a sailboat? Since the beginning of the nineteenth century, the gulf of San Remo has hosted important sailing events and prestigious regattas. The “Compagnia della Vela” (i.e., The Sail Company) was founded in 1920 and its members devoted their time to regattas on board sailing boats and other types of boats. The Sail Company then gave rise to the San Remo Yacht Club which promotes many important events, such as the Pre-Olympic Springtime Criterium and the famous “Giraglia” – one the most important high sea regattas in the Mediterranean Sea. Young sailors as well can prove their skills since the club organises international regattas for Optimist and Equipe classes during which European contestants can compete. 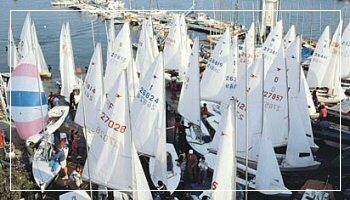 Other important events organised by the San Remo Yacht Club are the West-Liguria Winter Championship and Italian and international championships. At the Yacht Club you can rent sailboats and motor boats or take part in sailing lessons (for adults and children) which are organised every year. Courses for children last 15 days during summertime, while courses for adults are organised according to the participants’ needs. Theory lessons are held in a classroom. Trident, 420, Equipe, and Optimist boats will be used. The wide expanse of sea between Tuscany and France hosts the Whales Sanctuary and boat trips to the sanctuary leave from San Remo because it is here that whales can be sighted on the open sea. Whales, dolphins, and bottle-noses have always lived along Ligurian coasts and sighting them during boat trips is quite common. When we talk about scuba diving, we usually think about the colourful seabed of the Caribbean Sea, or the marvellous coral reefs where you can swim among multicoloured fish and shipwrecked vessels full of priceless treasures. Yet even in the vicinity of San Remo, you can immerse yourself in the Mediterranean and find a marvelous seabed rich in marine fauna. Diving centres offer the possibility to dive in places where giant sea mammals usually live. You will thus be able to swim next to then and enjoy a unique experience. In San Remo you can find two Diving Schools: Centro Immersioni Aton (Aton Diving Centre) and San Remo Sub (Sub San Remo Diving). Here you can get information on diving excursions and the necessary equipment.